Just about everyone agrees with the fact that mold is one of the last things they would ever want in their home. Not only is it gross and sends a musty odor throughout your home, but it can also be detrimental to your health. This is especially true for the young, elderly, and those with weak immune systems. Fortunately, most instances of mold can be prevented if you are active in preventing from ever becoming an issue in the first place. 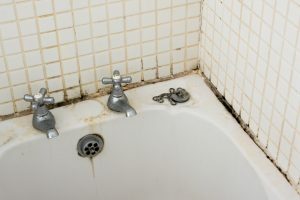 Our professional mold removal technicians at Daystar Cleaning in Bay County deal with mold every day and the vast amount of mold problems could have been prevented. Below are six tips you can use TODAY to ensure that your home remains mold free. Without moisture, mold will never be able to grow so it makes sense that this is a huge priority for preventing mold growth. If any moisture spots accumulate in your home, you should make sure to have them dried within 24 hours. This is because mold can begin to grow within 24-48 hours after the environment it can grow in is created. Usually, it takes closer to 48 hours than to 24, but just to be safe you should try to have all the moisture dried out within 24 hours. Whether you are building a new home or renovating an old one, you should consider investing in mold resistant products to decrease the probability of mold growth in the future. Examples of this include mold-resistant drywall and paint that contains mold-inhibitors inside it. The EPA recommends keeping indoor humidity between 30 and 60 percent. You can measure humidity with a moisture meter purchased from your local hardware store. You’ll also be able to detect high humidity by simply paying attention to potential problem areas in your home. Telltale signs of excessive humidity include condensation on windows, pipes, and walls. The ground near your home should be sufficiently sloped away from your foundation so that water does not pool and collect there. If it isn’t sloped correctly, water is likely to collect and seep into your crawlspace and basement. As temperatures decrease, the air is able to hold less moisture which subsequently leads to a smaller chance of mold growth. To increase airflow in your home, you can use fans, run your AC, open doors between rooms, and open doors to closets that may be colder than the rooms they are in. If you add each of these methods to your mold prevention arsenal you can have high confidence that your home will not be a target for mold damage. Nonetheless, we know that these things are still out of your control at times and the mold grew despite your best efforts. If this is the case for you, don’t hesitate to contact us at Daystar Cleaning in Bay County. We are here for you to make sure your home is mold-free!